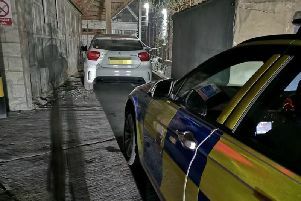 A motorist who was involved in a near-miss with a police car has been banned from the road after she went on to fail to provide a drink-drive specimen. Chesterfield magistrates’ court heard on March 25 how Louise Crookes, 33, of Applewood Close, Belper, had been driving with a passenger on Haddon Road, at Bakewell, when she almost collided with a police vehicle at a roundabout. Prosecuting solicitor Sarah Haslam said: “Officers came across a vehicle as she entered a roundabout and it almost collided with the police vehicle which took evasive action. Mrs Haslam added that Crookes told police she had consumed one pint and she was asked to give a roadside breathalyser sample but she was obstructive and rude and she said she was short of breath. Crookes failed to provide an intoxilyzer specimen by not breathing hard enough after the incident on March 10, according to Mrs Haslam. The defendant pleaded guilty to failing to provide a specimen of breath as part of an investigation into whether she had committed an offence. Cookes told the court she had ended up going the wrong way after she had been told to do so because she had been lost. Magistrates fined the defendant £340 and ordered her to pay a £34 victim surcharge and £85 costs. She was also disqualified from driving for 12 months but this can be reduced if she completes a drink-drive rehabilitation course.